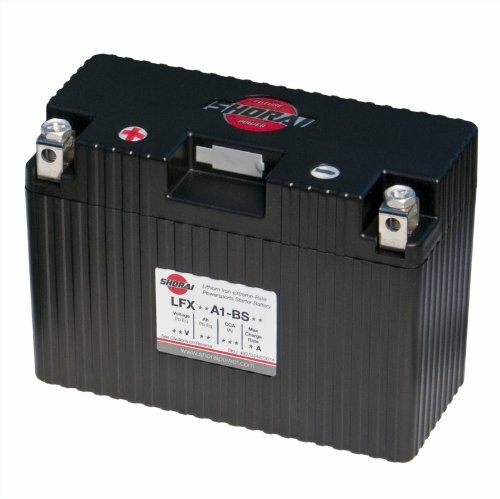 This Lithium Iron Powersports battery is a 18Ah 12 Volt "A" polarity, Case Type 1 battery. It is ultra-light and weighs one fifth the weight of lead-acid batteries on average. The battery is safe and no explosive gases during the charge. It features a faster cranking for a better start. After several successful rides over 3 weeks, battery suddenly showed 10V with minimal load (vice 14V for every earlier use) prior to starting. No decline, just sudden 4V low load drop between one use and the next. Attempted trouble shooting per Shorais web site and email response from Shorai with no success. Specified trouble shooting included attempting to charge off bike with an older style car battery charger. Now prepping for a warranty return to Shorai after I get a return label from them. At this time I cannot recommend this battery for routine street bike use. Shorai got back to us yesterday. A new battery is on its way via FedEx. They still don't have a final reason for the failure but they have been courteous and responsive by email. At this time I've moved my rating up to 3 stars (from 1) based on their help by email and shipping a new battery. Battery was only slightly smaller than the stock unit but weighs almost nothing in comparison. And it starts my RC51 right up, the old lead acid battery was having a hell of a time turning over the high compression V-twin. The included foam padding was easy to apply in order to keep the smaller battery snug in my battery box. I applied to the battery instead of the case in order to make it easier to remove if I ever go back to a standard lead acid battery... doubt I ever will. Smaller, lighter and more cranking power!! Wish I had done this upgrade years ago when I first heard about Lithium Ion batteries.